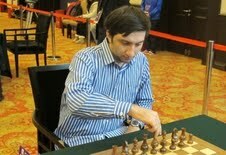 Vugar Gashimov: "Finally I started to play the piano"
The Azerbaijan grandmaster came to the press-centre after the 5-th round, when he had beaten Wang Hao from China. - Funny, I almost always spoil the mood of the leader, even in unlucky tournament for me. - smiled Vugar. - Generally, these SportAccord Mind Games are very interesting to compete in. I would like to mention that the list of players is really strong. Probably this kind of tournaments will be more interesting since FIDE has decided to organize a special rating list for rapid and blitz events. - Did you go to see the other events? - Not yet. I can say that I play checkers a little. Interesting game. But not so interesting as chess, of course. - How can you evaluate this year in general. - Not too bad a year. I played a small number of competitions - The World Cup and 2 team competitions for our national team. But I will return top 10 in January, when FIDE publishes the new ratings. - What is the most interesting thing in your life outside of chess? - I always dreamed about playing the piano, because the music might be the best thing created by humanity, and the combination with chess is perfect - you can forget all the worries of the game when you play the piano. So, I started to learn this year. I already know the notes, which scared me before, and I can play one melody. It is "River flows in you".